The purest and most absorbable source of this essential mineral. Magnesium Oil delivers this essential mineral in its most absorbable form. Magnesium Oil`s salt structure provides the most absorbable source of elemental magnesium - unscented and uncontaminated by pollution. BetterYou Magnesium Oil uses a source of magnesium chloride mined only in the North of Holland, over a mile below the ground and over 250 million years old. Unlike salt sources from open seas, this source is completely uncontaminated by toxins from modern industrialisation and man-made pollutants. BetterYou uses only the purest source of magnesium chloride, with only a trace presence of other minerals. The process of mining this precious mineral utilises unobtrusive drilling pipes which dissolve the seam in spring water and then pump it to the surface. A chemical `fingerprint` is then taken to ensure a consistency in purity and a certificate of pharmaceutical quality is granted for every approved batch. Only through this process can BetterYou provide its Magnesium Oil spray. Up to 800 measured sprays. 18mg of optimally absorbable magnesium in every spray. In 1997 over 70% of Americans were thought to be deficient in magnesium and in 2003 the average UK diet contained only 60% of the RDA of magnesium. Mass Farming practices: Magnesium and other minerals have been depleted from much of the soil that we grow today`s produce in. Similarly fertiliser is often magnesium poor yet calcium rich. Medications: Many man-made drugs and phosphates from fizzy drinks and sweeteners like aspartame cause the body to waste magnesium by binding with the magnesium molecules. Aqua 68.15%, Zechstein source Magnesium Chloride 31%, Trace Minerals 0.85%. Start slowly and grow to 5, increasing to 10 sprays morning and night to help restore magnesium levels to normal. Apply directly to the skin ideally after a shower and gently massage in. Can be left to dry naturally. Always test skin for possible negative reactions. Will not stain. 10 daily sprays is equivalent to 180mg of pure, natural and absorbable elemental magnesium. Can be sprayed directly onto the gum area or added to mouthwash to help promote healthy teeth and gums. Hold for a few minutes and then spit out. Can be swallowed safely but may have a laxative effect. Halve the dosage for children under 12 years old. Avoid contact with eyes and broken skin. 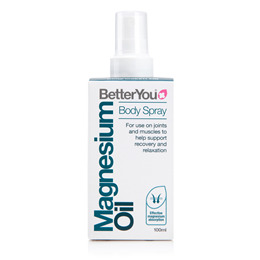 Applying BetterYou Magnesium Oil after a shower is a pleasure that is both stimulating and beneficial. People with sensitive skin however may find that initial applications `tingle` or `sting`. Apply directly onto wet skin initially to reduce tingling. Alternatively decant half the contents of the bottle and dilute the remaining spray with water (bottled preferably). Add 20ml of carrier oil to the spray. This acts as a buffer and is wonderful for self or partner massage. Below are reviews of BetterYou Magnesium Oil Original Spray - 100ml by bodykind customers. If you have tried this product we'd love to hear what you think so please leave a review. Better You magnesium spray has reduced my leg pains, muscle twitches, and cramps. I ran out earlier this year and the pain and cramps returned so I bought magnesium supplements which had no effect. I now make sure I have at least one full bottle as a backup. The downside is that it dries out my skin and can sting if I don't keep using body lotion. It's made no difference to my poor sleep. I purchased this with the hope it would help my migraines, but it's too early to tell, it does however help with restless legs at night, I have noticed a difference when I haven't used it. The only thing I don't like is that it's difficult to absorb fully, leaving my legs kind of clammy - it means I only use it at night when I'm changing into my pjs. I know this brand do a gel and I think perhaps that would be better for me. I am amazed how well it works on my joints. I use this spray after a shower for fast absorption of magnesium, for better sleep and to reduce leg cramps, it seems to be working! Good product, excellent service as always. I suffer from M.E. and do not sleep very well, but since using Magnesium Oil Spray instead of the capsules, I am sleeping deeper and for longer. I am very pleased with this product. After about a month of continuous use, my muscles stopped aching and feel more relaxed even when I'm stressed. Helps me sleep better and fall asleep easily. Highly recommended. The best form of magnesium you can take! Fantastic product. Spray on after my shower. Good tingly feeling means you are deficient in mag. Easy to use for my aches and pains and sleep issues from having Fibromyalgia. Great for PMS too. Directly abosrbed into your system. Thoroughly and highly recommend. I have always had problems being able to relax and fall to sleep. Most nights I would still be awake at 3am. Even when I did get to sleep, I would wake up every hour. From the first night of using Magnesium Spray my sleeping has improved greatly. I feel more relaxed in myself and am able to 'drift off'. I sleep soundly for at least 4 hours, sometimes more, if I am disturbed in the night I am able to drift back to sleep. Magnesium has made such a difference. I would recommend everyone with sleep problems using it. Very very good. I suffer from leg cramps at night so just a little spray and massage in to legs and hey ho cramp has nearly gone. Great product have bought it many times from BK. I use it after workout on muscles and every day on my scalp. Just make sure you don't spray right after shaving it will burn like crazy. Excellent way to get magnesium without it causing diarrhoea. Magnesium is a co-factor for so many enzyme reactions in the body and probably the most important mineral to supplement with. This is a really convenient way to take it too - especially good to rub it into your skin after an evening bath or shower. I spray it onto my hand first then you can make sure where it is going ! Fantastic way to get extra magnesium into your body,a great product that rubs in easilly.Great for marathon runners like myself for use before and after races. 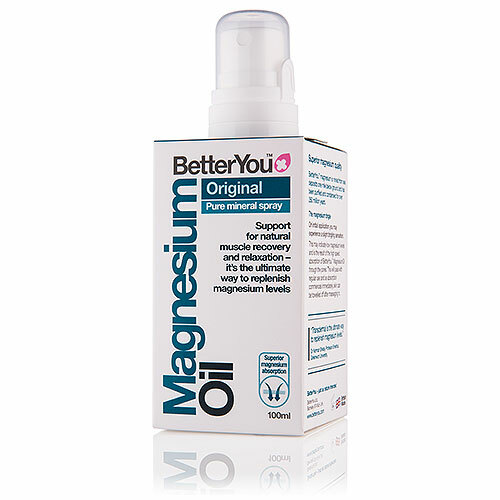 BetterYou Magnesium Oil Original Spray delivers this essential mineral in its most absorbable form. Magnesium Oil’s salt structure provides the most absorbable source of elemental magnesium – unscented and uncontaminated by pollution.